I know that hiding right in front of my fingers are shortcuts and secret keys you can press. I’ve searched. I’ve asked. I’ve read. From skipping the boring parts of YouTube videos to razor-sharp searches in Twitter, these are the best social media Mac keyboard shortcuts I could find. Just print out the keyboard and keep by your desk. Not a Mac user? You can find our graphic of all the PC keyboard shortcuts for social media pros here. I’ve included a few other shortcuts that will help you find cleaner data, uncover new blog post ideas, and become better at social media listening. Is a shortcut not working? The most common mistake is to put a space between the : (so to:Pepsi is correct NOT to: Pepsi). Go to Hootsuite.com. Click “Add Stream.” Click “Search.” Enter these filters in the search bar with the keyword you want to track. Use !YouTube + Keyword in DuckDuckGo to search results. Also works with eBay and Amazon. One of the best ways to get inside the minds of customers is to read product reviews. By using !YouTube Keyword in DuckDuckGo you can instantly pull results from YouTube. Or eBay and Amazon—for example: !Amazon Surfboards. Now, you can quickly read reviews and swipe real customer language to use in Tweets, emails, landing pages, and blog posts. Social media is filled with spam and vendors selling products, making it hard to see actual customer conversations. Use this filter (-filter:links) in Hootsuite to remove all posts with links. This reveals actual human conversations—such as people talking about what fashion products they like, car enthusiasts sharing what accessories they’d buy, and other little communities. In Hootsuite, add a ? to your keyword (example: real-estate?) and you’ll only see posts with questions. Whether you need a quick idea for a blog post (such as the best small cities to buy real-estate in?) or are looking to understand your customers better, this filter reveals gold. If you liked my social media keyboard, the templates below will also help you get more done on social media. 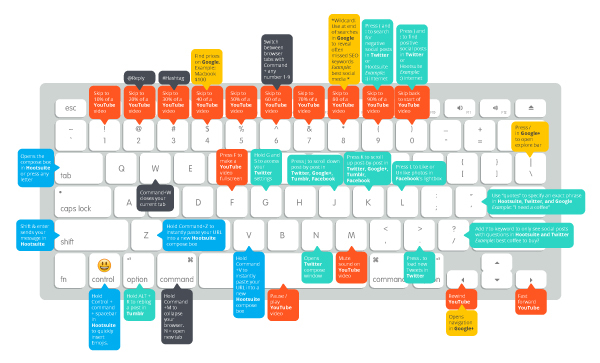 Hootsuite is the perfect platform to use all of your newly learned mac keyboard shortcuts. Try it free today.